Marketing Monday: Ignore the Box Entirely » Embroidery Talk Has Moved! 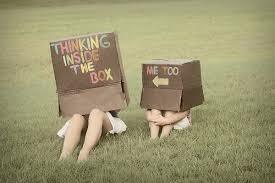 One of the pieces of advice that is now so overused it’s cliche is the advice to “think outside the box”. What this means is to think outside the conventional boundaries that surround whatever it is you’re considering. It is hoped that the result of this outside the box thinking will bring you to new solutions which will allow you to solve problems and use products in new ways. The problem with this advice is that it acknowledges there are a conventional set of thoughts regarding whatever you’re thinking about, and those boundaries can still limit you, even when you’re trying to think beyond them. At EnMart, we don’t just try to think outside the box, we refuse to acknowledge the box even exists. Our goal is to create new uses for “old” products, and to help our customers find ways to use our new ideas to increase their profits. I’ll give you a few examples, so you can see how the process works. The first example is one of EnMart’s newest products, embroiderable stuffed animals. Most people, when asked about these stuffed cuties, would say they’re primarily for children, mostly used as a stuffed toy or a birth announcement. The people who would say that aren’t wrong, that is the traditional box in which those animals have been placed, but there are lots of other ways they can be used. A embroiderable stuffed animal can be a souvenir, an advertisement, a gift bag, an expression of love (Happy Birthday/Valentine’s Day/Anniversary) and a wide variety of other things we just haven’t thought of yet. The only limits on what can be done with these animals are those of the construction of the animals themselves and the method used to decorate them. The potential markets for embroidery stuffed animals are practically limitless. How about one embroidered with the high school or college name and graduation date for a new graduate? What about a Greek version of the animals, with house and induction date for new pledges to a sorority or fraternity? Whatever your corner of the market and customer base, there is most likely some new use that can be found for these versatile animals. As a second example – let’s consider a simple countertop display for large cones of thread. Most displays holding large thread aren’t designed to sit on a countertop and, if they are, they’re generally boxy and unattractive or phenomenally expensive. When we were looking at options for a countertop display for our Iris poly and cotton quilting thread we knew we wanted something with a reasonable price, that was easy to set up and easily portable. We also wanted something that maximized the use of the real estate it took up in a store. When we couldn’t find anything that met our needs through traditional sources, we started looking elsewhere, and hit paydirt. The result is our rotating countertop disply, which holds 54 king cones, rotates for easy access to both sides, is easily portable so it can be taken to trade or craft shows, and is easily assembled. It’s a new use for a basic rotating display that any quilt shop will be sure to love. It is always easier, I suppose, to stick with conventional wisdom and acknowledge the box, but the problem with acknowledging the box, whether you’re thinking inside or outside of it, is that acknowledging the box won’t get you where you need to go. It’s often harder, but in the end far more rewarding, to forget the box entirely and start with a clean slate and a world of possibilities. The only limits are the ones dictated by the product and your own mind. This entry was posted on Monday, August 24th, 2015 at 3:37 pm and is filed under Marketing Monday. You can follow any responses to this entry through the RSS 2.0 feed. Both comments and pings are currently closed. Thank you so much for letting me contribute to your article and thank you for the opportunity to have some fun! The embroiderable stuffed animals were very easy to work with and I think they can be used in a multitude of ways. Out of the box ideas are always welcome in the promotional industry the “seen it all” attitude gets in our customers way, sometimes things just need to be presented on a whole different level.